Panthers skipper Ulrich Ostergaard (front) survived a nasty spill in heat 15 at Newcastle. Paul Starke (rear) top scored for Panthers with 12 points. Team boss Carl Johnson hinted that Peterborough Panthers are considering team changes after a third successive defeat last night (May 21). A depleted city side - featuring only three of their regular riders - went down to a 58-34 reverse at Newcastle, for whom three riders recorded maximums. Tom Bacon delivered his biggest Panthers' score at Newcastle. It was a second away loss in the space of 24 hours after a Saturday (May 20) setback at bottom side Berwick, and it left them siting third-bottom of the SGB Championship standings with a quarter of their league campaign now completed. The latest defeat came as no surprise given Newcastle ended a full-strength Panthers side’s unbeaten home record eight days earlier. Johnson’s men have since lost three riders to injury and were also without number one Jack Holder, who was enjoying a World Under 21 Championship semi-final success in Italy. “It’s certainly not the way we wanted the weekend to go,” said Johnson. Guest Rob Branford was the only heat winner for Panthers at Newcastle. “We lost a home meeting on Friday night due to the weather and have then had a tough time of it on the road. “We were confident about beating Berwick at home and that would have given us a confidence boost ahead of two tough away meetings, but we found ourselves going into them with a depleted team and couldn’t manage to pick up results. “This is certainly not the sort of league position we want to be in, but we’ve had a tough run with injuries and illness. “It’s down to the management and riders to turn things around and get ourselves moving in the right direction again. Panthers could only manage two race wins at Brough Park last night and both of those were provided by guest reserve Robert Branford. The rider, borrowed from Sheffield to cover for injury victim Bradley Wilson-Dean, took the chequered flag in heat two and the penultimate contest. Fellow reserve Tom Bacon helped to ensure both of those races ending in advantages for Panthers, grabbing second spot for a 5-1 in the second contest and then taking third in heat 14. Bacon achieved the biggest score of his Panthers career to date with 6+3, but the team were short of points from the main body of their side. Their two other guests - Lasse Bjerre and Dany Gappmaier - had nights to forget. 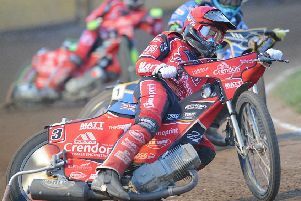 Bjerre, filling in for Holder at number one, managed only three points from four outings while Gappmaier, a short-notice replacement for Simon Lambert after his spill at Berwick, drew a blank. Berwick man Gappmaier piled up paid 14 points for his regular club against Panthers the previous night, but couldn’t get competitive at Newcastle. Paul Starke delivered a typically solid showing with a 12-point haul, which was boosted by a tactical ride in heat eight, when he was just unable to find a way past winner Ash Morris, who guested for Panthers at Berwick. Captain Ulrich Ostergaard was below his best with six points, but Panthers were relieved to see their skipper walk away from a heat 15 tumble. Another injury is the last thing they need. “The reserves both contributed well,” added Johnson. “But we struggled for points from the main body of the team. Panthers expect to have injured trio Wilson-Dean, Lambert and Kenneth Hansen back in action when they face three meetings in the space of four days over the Bank Holiday weekend. They go to table-toppers Edinburgh on Friday (May 26) and then call at Glasgow the following night. A home clash against Workington follows on Monday, May 29 with the start-time pushed back to 7pm. Wilson-Dean has a small fracture in his left hand, Lambert has tissue and ligament damage in his wrist, while Hansen is nursing a fractured breastbone and rib damage. NEWCASTLE: Steve Worrall 15, Lewis Rose 14+1, Robert Lambert 11+1, Ludvig Lindgren 7+2, Ash Morris 7+1, Ben Hopwood 4+1, Connor Coles 0. PANTHERS: Paul Starke 12, Rob Branford (guest) 7+1, Tom Bacon 6+3, Ulrich Ostergaard 6, Lasse Bjerre (guest) 3, Dany Gappmaier (guest) 0, Rider replacement for Kenneth Hansen.